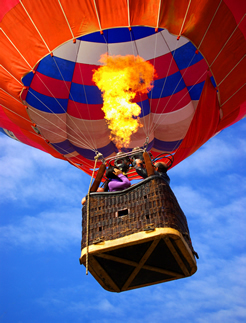 One can enjoy one of the greatest and most adventurous, enjoyable flight experiences by going on a hot air balloon flight over the South West of England. The free flying in the air, soundless lift in a basket attached to a large fabric envelope can’t help but give a feeling of being on “Top of the World”. Most people have this desire but very few get the chance / opportunity to fulfil it. The old, but successful, flight technology behind a “Hot air balloon flight”, which is still being used for great fun and adventure and enjoyment around various parts of the world. These days such flights are organized very successfully and during special occasions there are great programs being held in different countries for balloon ride passengers. Father’s day hot air balloon flights are among such special occasions along with birthdays. These types of occasions include great public gathering. Some people just come to see the balloon flights taking off from the ground and some come along for the fun and enjoyment by flying in the air standing inside of the balloon basket whilst sipping on their traditional glass of champagne as they float through the sky. On these occasions the prices are brought at a lower level. These reasonable flights are also put together with different categories like which balloon one decides to take for the flight and for what distance etc. There can be a great flight with many people and many balloons flying together in the air. During these occasions the sky appears filled with colourful balloons, balloons of different sizes and shapes. For passengers wishing to fly alongside other balloons then they fly with us at balloon festivals, such as Tavistock Balloon Fiesta, or equally they hire the balloons via our private / exclusive balloon flights page. On Father’s day hot air balloon flights are very cheap and there are some attractive plans where some times the cake or some other complimentary gifts are provided free of cost along with the flight. There are various places all over the world where one can enjoy a Father’s day hot air balloon flight. On these kinds of special occasions people generally prefer taking their family with them and they can have a great time with professional hot air balloon pilots who take care of them all the time during the journey whilst the pilots’ crew / retrieve stay on the ground following the hot air balloon. The best way to give your family a great time during occasions like father’s day, mother’s day or any such day is by taking all of them to a hot air balloon flight to experience it themselves. A special day with a great difference can really bring lots of happiness to the family and such a day will be memorable because of it’s so unique and special. PLEASE NOTE: Spaces still available on Father’s Day Balloon Rides. Please check Flight Availability for more information.